Wharfside has been supplying beautiful and bespoke contemporary furniture for 55 years. No surprise, then, that the East London-based retailer has lavished such care and attention to detail on the specification of its first Mercedes-Benz delivery van. The Sprinter 316 CDI Long chassis cab arrived via Surrey and Sussex Dealer Rossetts Commercials, equipped with a host of factory options, including air-conditioning, a Comfort driver's seat with armrest, an uprated satellite navigation and audio system, and a reversing camera. Its high-volume, alloy Luton body is by Kira (UK), of Chelmsford, Essex, and fitted with a full complement of tie rails, as well as a roller shutter door and 500 kg Ratcliff column lift. 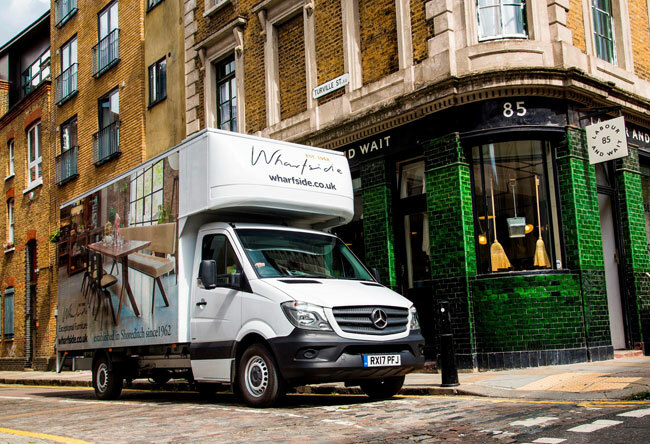 Completing the picture, the vehicle wears an eye-catching vinyl wrap livery so that as well as being perfectly tailored to its primary delivery role, it doubles as a highly effective mobile advertisement for Wharfside's high-end products. Managing Director Jonathan Stewart is maintaining a fine family tradition. His grandfather served a cabinet maker's apprenticeship in London's East End in the early 1900s, and his father trained as an upholsterer before starting his own company on being demobbed from the army. He founded Wharfside when he began importing Danish furniture in 1962. The business still operates from the warehouse and showroom in Shoreditch that has been its home since 1965, as well as a second store in Leatherhead, Surrey. Today, however, Wharfside commissions its luxury, solid wood furniture from factories throughout Scandinavia and northern Europe, while its own workforce includes highly skilled, time-served polishers, cabinet makers and upholsterers. Wharfside serves customers throughout the country, although most are located in London and the South. The Sprinter is its only delivery van, the company having previously sourced a succession of vehicles from the same, rival manufacturer before reliability issues prompted its decision to seek an alternative supplier. It is allocated to installers Darias Dina and Mircea Nelutu, but they are regularly accompanied by Warehouse & Installations Manager Laurie Heeney. "In terms of comfort, driveability and all-round quality, the Sprinter is in a different league to its predecessor," enthused Mr Heeney. "The body is also perfectly tailored to the job. It was built to the maximum permissible size for the chassis and has raves from top to bottom so we can securely carry furniture of all dimensions, while the Luton dome over the cab roof provides valuable additional storage." Wharfside's Sprinter has a smooth and responsive four-cylinder engine which produces a sprightly 163 hp but is also proving impressively fuel-efficient. "With just under 4,000 miles on the clock we've averaged 23.6 mpg, whereas our previous vehicles struggled to hit 21 mpg," revealed Mr Heeney. Like all Mercedes-Benz vans, the Sprinter came equipped as standard with a market-leading armoury of safety technology. This includes the innovative Adaptive ESP® stability system, which will intervene to help the driver retain control in an emergency situation and automatically adjusts its parameters to take account of the vehicle's load status. The vehicle is also backed by a three-year, unlimited mileage warranty, and MobiloVan cover, which includes free, European and UK roadside assistance. Mr Heeney added: "We received an excellent service from Rossetts Commercials' Fleet Sales Manager Sean Meadows and could not be happier with our Sprinter, which looks fantastic."